European Union regulators have launched an in-depth investigation into Google's $3.1bn (£1.5bn) takeover of online advertising firm DoubleClick. The EU Commission said its initial probe had shown the deal would raise competition concerns. It has set itself a deadline of 2 April 2008 to reach a decision. Google said it would work with the Commission to show how the acquisition would benefit publishers, advertisers and consumers. "We seek to avoid further delays that might put us at a disadvantage in competing fully against Microsoft, Yahoo, AOL and others whose acquisitions in the highly competitive online advertising market have already been approved," said Google boss Eric Schmidt. The European Commission is working closely on the case with the US Federal Trade Commission, which has been reviewing the deal since May. Both Google and DoubleClick are involved in online advertising, although they have different roles. DoubleClick helps link up advertising agencies, marketers and web site publishers hoping to put ads online and track them. 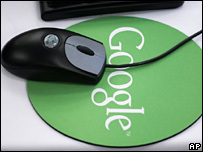 Google allows firms to target advertising at people using particular search terms and also stores information about users' internet surfing habits.